Our local politicians, policemen, firemen and the man next door will be putting on their high-heel sneakers an goin’ to town Wednesday, April 4th, at 4:30 p.m. to participate in this years “Walk a Mile in Her Shoes.” If you would like to lend-a-hand, or in this case lend-a-foot, in bringing awareness to the problem of sexual assault in our community join your brothers at Plaza de Cesar Chavez. At last years event all the guys seemed to be having a blast, but from the look in their eyes I recommend heels that are not too high and a box of Band-Aids! I had not been to the library in a zillion years. Then I discovered they had DVDs, CDs, and up-to-date computer books, along with eBooks online. All for free. The newer libraries have comfortable reading areas, study rooms, and Wi-Fi. I am now a frequent visitor. This weekend the Downtown King Library is having a book sale in the Patio Area. On Saturday, hardcover books are $1 and soft cover books are $.50. Then on Sunday, they are having a bag book sale. Five dollars for all the books you can fit into a large paper bag; the library supplies the bag. The library uses the revenues from these book sales for a variety of community and literacy projects. The King library and the various branch libraries have ongoing special book sales and events. Locations and more information is available on their web site. Posted in Books, Free, Library, San Jose | Comments Off on Books! Books! Books! There are some new changes at Norman Y. Mineta San José International Airport. 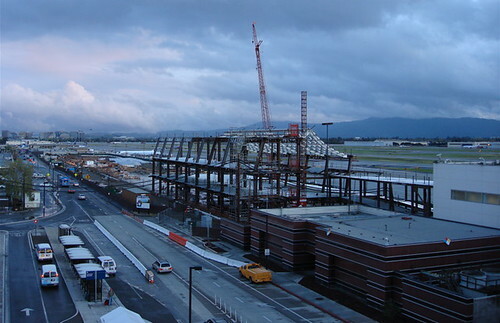 Terminal B’s North Concourse, which is currently under construction, is starting look as though someday it may actually be finished. Frontier Airlines now offers year-round service to Cabo San Lucas. The flights will include four-day-a-week service on Mondays, Wednesdays, Fridays and Saturdays. From mid-August through mid-November, the frequency will be reduced to one non-stop on Saturdays. After mid-November, the frequency will increase again to four flights a week. JetBlue Airways is adding a midday flight between San José and New York’s John F. Kennedy International Airport beginning May 1st. Southwest Airlines added two daily nonstop flights between San José and Las Vegas. On May 13th, Southwest Airlines will be adding daily nonstop service to Chicago Midway Airport and to Burbank. When I drive past the vacant building at Bird and Minnesota Avenues in Willow Glen, that was once an Albertsons, I can’t help but wonder what business will eventually occupy the space. I believe most Willow Glen residents would prefer a new grocery over another type of retail. I’m happy to report that our wish may come true. Yesterday afternoon I stopped in at the Zanotto’s market on Naglee Ave. to pick up a few things and ask any employee, or anyone who looked to be a Zanotto’s family member, my question. My question is always the same, “So, do you think Zanotto’s will be opening in Willow Glen?” The reply is always a version of, we don’t know. Yesterday was different. Yesterday I was told that things are being worked out, and it would take approximately five months to get the store ready to open. Not a positively absolutely yes that Zanotto’s will takeover the old Albertsons, but close enough to start a shopping list for Thanksgiving. Today, Adobe (the guys with the big towers in Downtown San Jose) unveiled the new Creative Suite 3 packages. This is their largest product launch to date. Go have a look at the Creative Suite. Watch the live webcast this afternoon, if you’re interested, too. The nation’s best female hockey players will compete in the 2007 USA Hockey Girls’ National Championships at Logitech Ice this Wednesday through April 1. The tournament features 48 teams in four divisions – 19 & under, 16 & under, 14 & under, and 12 & under. It will be the largest ice hockey tournament ever held in California. As hosts to the National Championships, the San Jose Jr. Sharks Girls Hockey Club’s teams receive automatic berths in the tournament. Former Sharks defenseman Tom Pederson (1992-96) coaches the girls 16 & under and 19 & under teams; also, former Sharks forward (1993-96 & 1998-99) and current radio analyst Jamie Baker coaches the 12 & under team. A tournament pass is $30 and day tickets are $15. Discounts are available for children 5-17 and seniors 65 and over. Children under 5 attend for free. Yesterday morning I managed to make it to The Tech Museum in time catch most of an exclusive press event launching an exhibit of the top 25 inventions of 2007. A panel of three Hall of Fame Inductees Jim Fergason, Tom Fogarty and Ted Hoff were just winding up their advice to inventors. One tip offered was, don’t be afraid to make mistakes but at the same time know when to give up and move along to another project. I spoke with Mr. Fergason, inventor of the first practical use of liquid crystals. LCD technology has been an important part of many consumer products, and one of my favorite 1970s fad, the ever fun device used to respond to thermal patterns and converting them to visible patterns-better know as the Mood Ring. Liquid crystals are now in alarm clocks, digital watches, radios, calculators, laptop computer screens, flat-panel TVs, cell phones, and iPods. Mr. Fergason and I discussed the importance of nuclear energy until he was needed for a group photo. Jim Fergason top row to the left-red tie. If I can find time in my schedule I’ll be at The Tech today for a panel discussion moderated by Scott Budman of NBC-11’s “Tech Now.” Topics will include the changes, challenges, and the future of the invention process. Personal tours of the Modern Marvels Invent Now Challenge exhibit will be available. The exhibition will make its way to Vanderbilt Hall in New York City’s Grand Central Terminal the week of May 14, 2007. 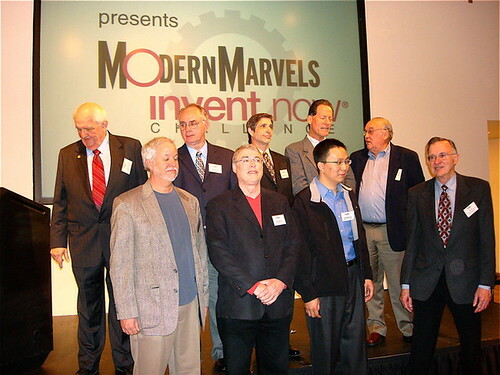 The Grand Prize Winner of the ‘Modern Marvel of the Year’, to be chosen during Modern Marvels: Great Inventions Week on The History Channel May 15 – 17, will be awarded a $25,000 grant. Check The History Channel for TV coverage. Please join me in welcoming our 54th Metroblogging City, Kuala Lumpur. Founded in 1857 as a tin mining outpost, KL is the capital and largest city of Malaysia boasting a population of nearly 2 million in the city and almost 10 million in the surrounding metro area. A couple KL points of interest: The Petronas Towers, a recognized landmark worldwide, is currently the second tallest building in the world (Top 3: Taipei 101, Petronas Towers, Sears Tower). The Bukit Nanas Forest Reserve is an inner-city tropical rainforest believed to be well over a million-years-old. The best part in my book, Kuala Lumpur hosts the Malaysian Formula One Grand Prix. Petronas Towers photo courtesy Jpatokal. State Historical Landmark NO. 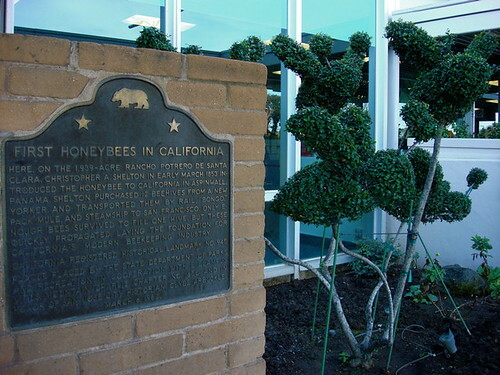 945 First Successful Introduction of the Honeybee to California. Here, on the 1,939-acre Rancho Potrero de Santa Clara, Christopher A. Shelton introduced the honeybee to California in early March 1853. In Aspinwall, Panama, Shelton purchased 12 beehives from a New Yorker and transported them by rail, ‘bongo’ pack mule, and steamship to San Francisco. Only enough bees survived to fill one hive, but these quickly propagated, laying the foundation for California’s modern bee-keeping industry. Thanks to Christopher A. Shelton, his work with honeybees and the pollination of such species as: cherries, peaches, soybeans, apples, pears, pumpkins, cucumbers, raspberries, blackberries and strawberries, our valley became recognized for its orchards, and farms. Though virtually all of the farms in San José have been replaced with homes and high-tech we still feel a connection with those early days. Many in this valley have parents or grandparents who worked in orchards or at packing plants. Now something urgent is happening with honeybees of which we all need to be aware. Posted in Bay Area, Community, History, News | Comments Off on Honeybees-Going, Going, Gone?